For these special events, a section of the stands is reserved for people and their dogs. Back by popular demand, the Atlanta Braves are hosting Bark in the Park, presented by WAG-A-LOT, on Sunday, May 20 at SunTrust Park! You and your dog can come cheer on the Braves as they take on the Miami Marlins at 1:35 p.m. You’ll enjoy the game from the Xfinity Rooftop and every dog will receive a Braves leash to wear proudly around town! Tickets are very limited and must be purchased in advance, so lock in your plans now to join us at the ballpark. Join the D-backs and our canine companions at Chase Field for Bark at the Park on Sunday, May 6 against the World Series Champion Houston Astros! Be sure to come early to participate in the pre-game Puppy Parade on the warning track at Chase Field. Enjoy the fun of Bark in the Park all season long, and save along the way! The four (4) game Bark in the Park Season Pass will be $160 total and include one (1) DOG ticket and one (1) HUMAN ticket to each of the four (4) BITP games throughout the year. Bark in the Park dates: Reds vs. Mets – May 8; Reds vs. Colorado Rockies – June 5; Reds vs. Milwaukee – Aug. 29; Reds vs. Kansas City – Sept. 25. Bring your Astros Rally Pup to enjoy the game at our annual Dog Day at Minute Maid Park on Sunday, September 2nd. Your pup will love watching the Houston Astros take on the Los Angeles Angels at 1:10 pm and can participate in many of the fun, unique Dog Day activities such as a costume contest, pregame parade around the field, and more! The Kansas City Royals are excited to host Bark at the Park again in 2018! This year’s four events will be held on April 24, May 30, August 15 and September 12, 2018. On Saturday April 14th, the Dodgers will hold Pups at the Park at Dodger Stadium. Fans that purchase a special event ticket in the Right Field Pavilion are invited to bring their dogs to the park and help cheer on their home team as the Dodgers host the Arizona Diamondbacks at 6:10pm. Sunday, August 27th. Bring your pup to Marlins Park to celebrate our annual Bark at the Park event. For the second time this year, we want to pack the park with our furry friends! Tickets for you and your dog are located in our Vista Level Reserved when you purchase a special event ticket. Proceeds will support the Humane Society of Broward County. Don’t let sleeping dogs lie on Thursday, May 24, as all four-legged friends are welcome to cheer on the Crew as they face the Mets. Fans who purchase a ticket package for Bark at the Park, presented by Nylabone and Pets Add Life, will be able to bring their canine companion to the game, plus receive a Brewers dog leash. To top it off, a portion of all Bark at the Parkticket packages sold will go to the Wisconsin Humane Society and Animal Rescue Foundation. Join the Mets, North Shore Animal League America and Animal Rescue Foundation for Bark At The Park at Citi Field! Bring your canine companion and support these no-kill animal rescue and adoption organizations. Bark at the Park dates: Mets vs. Philies – April 2; Mets vs. Colorado Rockies – May 5; Mets vs. Marlins – Sept. 10. Take your best furry friend out to the ballpark at the annual Bark at the Park event, presented by AvoDerm Natural & Nylabone. This year’s event will be held on June 29, when the A’s take on the Cleveland Indians. All dogs and owners are invited to a pregame party, as well as a Pup Parade on the field. Bring your Pup to the ballpark EVERY Tuesday home game in 2018. Enjoy America’s Favorite Pastime with your four-legged pal by your side in an elevated backyard-inspired setting at Petco Park. The Barkyard presented by Petco is a fan favorite and features five semi-private, dog-friendly viewing areas in left-center field for every Padres home game accommodating up to four people and two dogs. Pricing starts at $104 for each viewing area and includes four tickets. New this year, fans wishing to attend 10 or more games in The Barkyard will have access to a Flex Membership in The Barkyard along with Padres Flex Membership benefits. The designated Pet Relief Area in the Park at the Park is conveniently located nearby. Come celebrate National Dog Day by bringing your best friend to AT&T Park! Sunday, August 20 vs. Rangers 1:05PM. Strut your stuff in a pre-game parade and costume contest! Grab your dog and join us at Safeco Field for one of four (4) Bark at the Park Nights. Dog Pack includes a human ticket, dog ticket, Mariners giveaway and postgame walk around the bases for just $50. Bark at the Park dates: Mariners vs. Astros – April 17; Mariners vs. Rangers – May 29; Mariners vs. Angels – July 5; Mariners vs. Orioles – Sept. 5. On Saturday, May 5th, the St. Louis Cardinals host the 14th Annual Purina Pooches in the Ballpark. The purchase of a special ticket will grant you and your pooch the opportunity to enjoy the game in pet-friendly sections of the ballpark. You and your pooch are then invited onto the field to participate in a pre-game costume parade around the warning track. Pets are encouraged to show their Cardinals pride by wearing weather-appropriate team gear or their best summer-inspired costumes for a chance to win prizes and unique opportunities courtesy of Purina and the St. Louis Cardinals. All participants will receive a Purina goodie-bag and a Cardinals Pet Treat Jar courtesy of Purina. Sunday, April 15 at 1:10 p.m. vs. Philadelphia Phillies. The Tampa Bay Rays invite you and your puppy pal to Dog Day at the Rays presented by Tito’s Handmade Vodka – Vodka for Dog People at Tropicana Field when the Rays take on the Philadelphia Phillies! For just $30 ($40 value) this specially priced ticket package includes a seat for you and your best pal in the tbt* Party Deck, Rays Dog Day themed item and dog themed activities throughout the game. Texas Rangers vs. Toronto Blue Jays. Bring your dog to Globe Life Park on Saturday, April 7, 2018! Dress your dog in their best Rangers gear and participate in a pre-game parade around the warning track. Don’t miss out on this unique event to watch the Rangers take on Toronto with your favorite furry friend! Skip the dog park and come to Nationals Park! Pups in the Park Presented by Budweiser is a unique opportunity to bring your dog to a Nationals game. 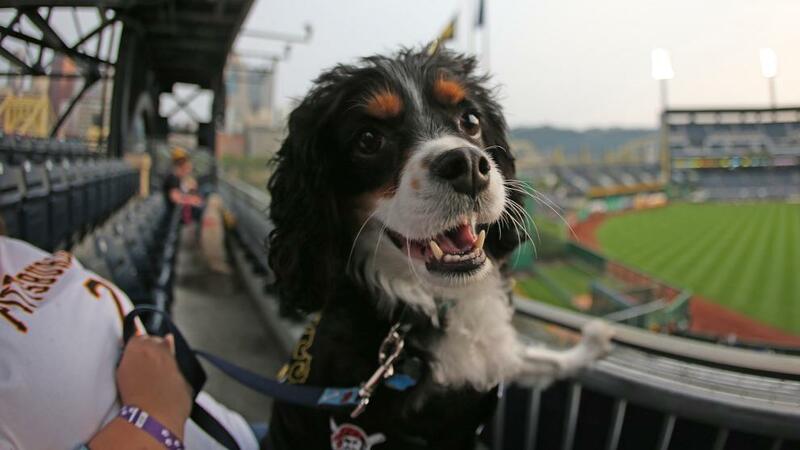 You and your dog will both get to enjoy the game with other dogs and dog lovers from seats in our pet-friendly Outfield Reserved section. We have 6 Pups in the Park games in 2018: Sunday, April 8 at 8:08pm vs. New York Mets; Sunday, April 29 at 1:35pm vs. Arizona Diamondbacks; Saturday, May 19 at 7:05pm vs. Los Angeles Dodgers; Saturday, June 23 at 4:05pm vs. Philadelphia Phillies; Friday, September 7 at 7:05pm vs. Chicago Cubs; Tuesday, September 25 at 7:05pm vs. Miami Marlins.